When a country is right across a narrow gulf from another, it is reasonable to assume the two countries’ cuisine should influence one another’s. In Oman, Iranian (or Persian) food is not as visible as one might expect, but Omani food certainly benefits from a history of Persian/Iranian trade and culture. 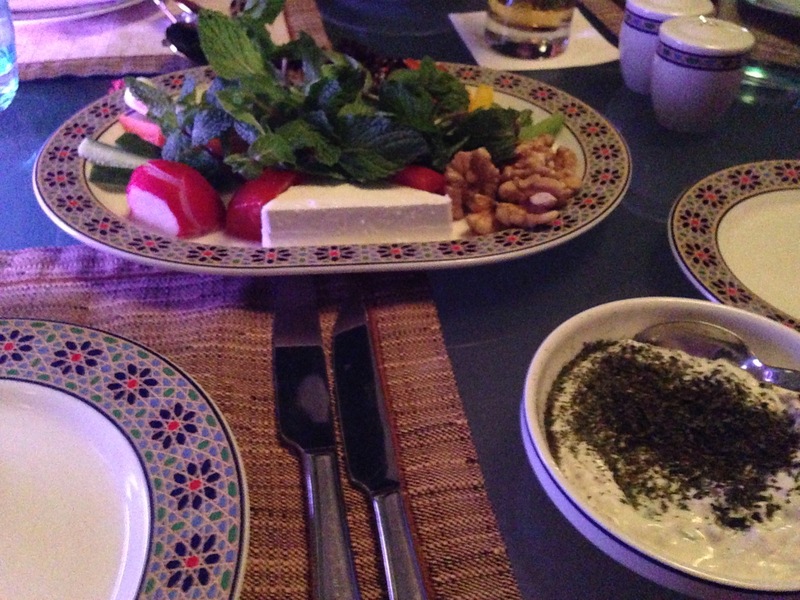 During my visit to Oman, I had the opportunity to experience sumptuous Iranian fare in a lovely setting. Shiraz, named after the city in Iran, is located in a beachfront hotel in the al Qurum neighborhood of Oman. Their menu, at first glance, appeared to be fairly expensive – most kabobs are 10 to 13 OMR (26 – 34 USD). In contrast, local Omani kabobs often run between 2 and 5 OMR. But the portions were quite large. I chose a promotional special that included a choice of two of their more popular kabobs and included a glass of house Merlot for 11 OMR. Based on the cost of our entrees, we did not order starters, which all looked delicious; however, the menu does not warn you that you will receive a complimentary and addictive plate of crudités, walnuts, fresh, salty cheese (resembling feta) and salad (in Oman, salad refers to pretty much any leafy green, including what we think of more as garnishes – parsley and mint, for example), along with delicious flatbread. The best accompaniment to that unexpected appetizer platter was an amazingly good yogurt sauce with cucumber and mint. It had a more complex, full flavor than Tzatziki and was so delicious that I ate it with everything – from bread to vegetables to rice and kabobs. My kabobs were excellent and were served with grilled vegetables and three preparations of basmati rice – saffron, green pea, and plain. Now, for the kabobs: I was very happy with my choices. My beef kabob had been marinated with pomegranate (juice or vinegar) and coated with chopped walnuts. It was tender, sweet, tart, and savory all at once. Although I had a lot on my plate (literally! ), I still managed to almost completely obliterate the beef kabob. A chicken kabob, marinated in yogurt and saffron, was equally tender and well cooked. The kabob was thick with yogurt, which sealed in the juices and also added a pleasant sourness. Though I had enough to tackle without sampling others’ meals, I did try one colleague’s traditional Iranian lamb stew. It was thick with what tasted like caramelized onions, and the lamb was tender and well seasoned. If I returned to Shiraz, I would have ordered that dish for a change of pace. Alas, my male colleagues – with one exception – could barely, if at all, finish their single or double kabobs, so I felt like a giant pig having almost obliterated two. We had no room for dessert, of course, so I do feel that we did not get the full Iranian experience, but a nightcap of complimentary mint tea – which is typical – was a nice, sweet finish. As this wasn’t my first experience with Persian/Iranian food, I wasn’t surprised at the lack of heat and spice in all of the dishes. One colleague was slightly disappointed that the designated spicy kabob was not very hot, but our kabobs were served with a single, grilled green chili pepper, which could add plenty of heat if one so desired. Shiraz was one restaurant that provided a feast fit for a sultan. My pomegranate-walnut kabob was outstanding, and I’m hoping I have inspiration to find a way to replicate those flavors at home. Stay tuned!